Experience the waterways of Russia on this Pre St Petersburg Conference Cruise. Red Square. During any season, at any hour of the day, Russia thrills visitors with its artistry, history and majesty. From St. Petersburg to Moscow, this 13 day voyage reveals the real Russia as never before! Arrive in Moscow and transfer to your ship. * After boarding, you have free time to relax before dinner. Relax this morning and enjoy an early lunch before your half-day tour of Moscow. See the famed Bolshoi Theater and stop at Red Square for a view of the brightly colored St. Basil’s Cathedral and a visit to the famous GUM Department Store. You also get the chance to experience the city’s Metro. Stay in the city center for an evening performance of traditional Russian folkloric music. Today you have a full day to further explore Moscow’s many buildings, parks and monuments. Or you may choose an optional experience: Take a morning tour to Tretyakov Gallery, the world’s foremost museum of Russian fine art. This afternoon you may visit the Cosmonaut Museum with displays that trace the history of space exploration or take a Jewish Moscow tour, illustrating the history and spirit of the Jewish people who settled in the city. Dine on board for dinner, then relax or take an optional Moscow by Night tour. After breakfast, travel to the city’s famous red brick enclosure known as the Kremlin. Go behind its walls to see historic gems like Tsar’s Canon and Tsar’s Bell, and tour inside two cathedrals. Enjoy a scenic cruise along the Moscow Canal after lunch as we depart the city. Arrive this morning in Yaroslavl, another Golden Ring city. Tour this ancient town rich in monuments and visit the covered food market, where you may shop for handcrafted souvenirs. During your free time, you may visit the Church of St. Elijah the Prophet, featuring detailed frescoes and icons. Return to your ship for lunch and departure. We dock this morning in Kuzino, a typical Russian village. From here, you visit the renowned Kirillo-Belozersky Monastery, founded by Saint Cyril in 1397. Take a guided walk through the monastery’s historic grounds, seeing several small wooden chapels, the Assumption Cathedral and a museum. You also have the opportunity to visit a children’s school in Kuzino or the local Merchant House. Return to your ship for lunch and an afternoon departure. Spend the remainder of the day cruising along the Volga–Baltic Waterway. This system of rivers and canals, spanning 229 miles and seven locks, links the Volga River with the Baltic Sea. Spend a relaxing day cruising Russia’s intricate waterways. 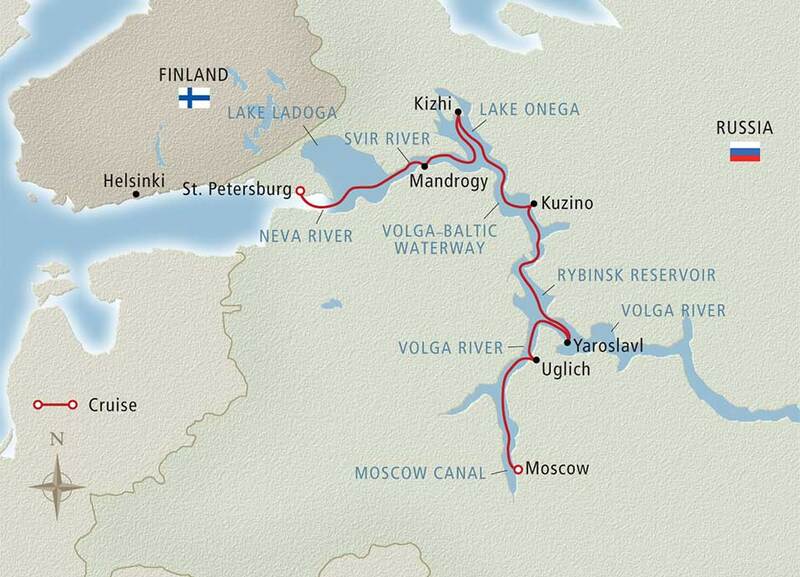 Sail the scenic Svir River, traveling the 139-mile “Blue Route” as it takes you southwest from Lake Onega. Stop in Mandrogy and take some time to explore this museum village. Visit the Vodka Museum or shop for handmade Russian craft items. For a truly immersive experience, try an optional visit to a banya, a traditional Russian bath house. Or, on board your ship, take the opportunity to witness and participate in the art of matryoshka doll making. Continue along the Svir, then cross Lake Ladoga, Europe’s largest lake, on your way to the Neva River. All meals are served on board your ship. Sail on the Neva River into St. Petersburg early this morning. After a leisurely breakfast, visit the Winter Palace to tour the legendary Hermitage Museum, where you marvel at the vast collection of art, antiquities, jewelry and sculpture. Return on board for an early dinner, followed by an evening performance of traditional Russian ballet. Today’s excursion goes to the Pushkin area where you visit Catherine Palace, the elegant rococo 18th-century summer residence of the Russian tsars, named for Catherine I (widow of Peter the Great). Tour its various halls, including the storied Amber and Agate Rooms, and see the ornate decor throughout. Return to your ship for lunch. After lunch embark on a city tour; see noted sights including St. Isaac’s Cathedral, Peter & Paul Fortress and Nevsky Prospekt. Dine on board, then relax or attend an optional evening folkloric performance. After breakfast, disembark and proceed to the airport for your return flight. * Or, choose to extend your voyage with 2 additional nights in St. Petersburg—giving you more time to explore this magnificent city—or extend your stay and attend the St Petersburg Conference immediately after. Want to attend the St Petersburg Conference?